As you may have heard, Apple recently release its newest version of the iPhone (the 4S) along with the latest version of their mobile OS. My hardware review will be later (after AT&T finally gets it to me). Now, I will concentrate on the OS upgrade that most iPhone owners can all enjoy. No longer does each Facebook update, text message, calendar event, or any other notification pop up in the middle of the screen and halting your concentration while trying to get that third star in Angry Birds. Instead, the top of the screen flips around like a billboard behind home plate at a baseball stadium to show you briefly what important has just been pushed to you. You can always see all your notifications by swiping from the top of your screen downward (in either orientation). Sure, Apple probably stole this idea from the Android platform or the Cydia store (for jailbroken phones), but hey the Romans “borrowed” and perfected many of the Greeks ideas. Can’t hate Apple for that. If fact, I love them for it. 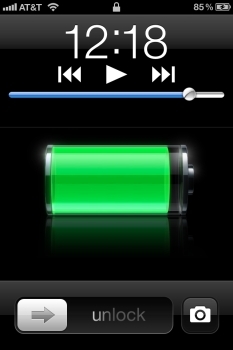 Personally, this is my favorite enhancement of iOS 5. Oh, almost forgot, these notifications show up on your lock screen too! HUGE DEAL! 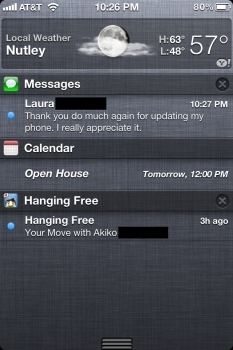 Slide any notification icon and you will brought right to that app. Hooray for convenience! You can set a location based reminder! So Apple took ridiculously long to get this feature out. I don’t know why it wasn’t a part of the original software, but at least it’s finally here. Again, Apple steps up the game with their incarnation. Sure, you can make to-do lists and setup reminders with alerts to go off at certain times, but now you can also create location-based reminders. So you can remind yourself to call into that conference call when you arrive at your job or call your momma when you leave the doctor’s office. Great feature. My complaint about it though is that the address you want to use must be in your contacts somewhere. So if I want my reminders to go off when I get to the store, I must have the store’s address in my contacts list. What would be better is if I could enter any address manually. Better than that, let me have a map or some kind of search feature built into the app to let me choose a place. How hard could this be to implement? Come on, Apple. Update please. 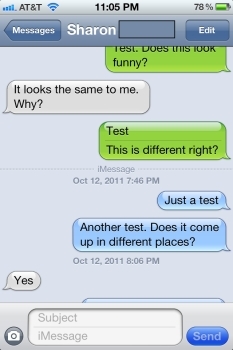 You can see where regular texts became iMessages. Pretty blue! Apple’s answer to BBM is a cute addition. I like it because it allows me to “text” my wife from my iPad when I’m on the couch. This is a welcome experience as I too often have found myself just out of reach of my phone, but needing to text her. Sure I could get up, but luckily I don’t have to anymore. More benefits of iMessage is the ability to see if the message was delivered, see if the other person is currently texting you back, and avoid using your more of your cell carrier’s text allowance (as it counts as data traffic, not a text). As I mentioned before, I can text from my iPad now, and with iMessage I won’t lose my conversation thread. If I start texting on my iPad, I can continue on my iPhone without skipping a beat. Everything looks the same. Of course, there is a catch. You can only iMessage other iOS users. You can use a phone number or email address to identify the other person. I have never owned a Blackberry, nor do I care to, but I disclose this so you know I have no idea what the draw of BBM has been. I will stop there as to not turn this into my editorial on RIM devices. That camera button will take you directly to the camera app! 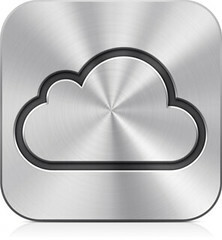 This may be the biggest leap forward for iCloud. Though it’s technically separate from the operating system, it is only enabled in 5.0 so it’s worth talking about. It’s great. I love it. 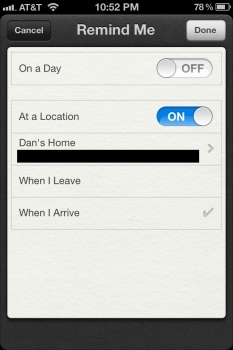 It keeps all the important things synced up: calendars, contacts, reminders, and notes. No longer do I have a syncing session to get my iPad, iPhone, and Outlook on the same page. It all happens seamlessly behind the scenes… really well, by the way! I can also have all my backups stored on iCloud, so if I get a new phone it all gets pushed to me without plugging in a cable. Excellent. I will be using this soon when my iPhone 4S comes in. Everyone is eligible for a free account with 5 GB of data to use, but know that iTunes music, movies, calendars, and contacts don’t count against the quota! Apps and their data will though, so that often takes a big bite out of your allotment. If you were a Mobile Me user, you have 25 GB to use for now. Pretty sweet. May just entice me to give apple $20 a year to keep that space available to me (I’m already using 17 GB for my iPhone and iPad). Another aspect is Photo Stream. Pictures I take on my iPhone go right to my iPad and PC automatically and vice versa, yes even from PC to iPhone and iPad. Again, this just helps alleviate the problem of my devices having different pictures available on them. Small caveat, if you want to sync your notes, you have to create a free .me account and use that as your iCloud account. This means you’ll have two accounts: your iTunes account name and your iCloud name. Kind of a pain, but at least you get another email address for free (username@me.com). There are over 200 new features of iOS 5, but they’re not really for us; they’re for the developers. Hopefully we’ll be seeing them pushing the envelope with new ideas for apps. Those apps really are what sets iOS apart from everything else. Sure there’s crap out there, but there are also some of the most innovative app ideas that you can see on a mobile device. At the very least, they are the most polished looking. iOS 5 is a great upgrade. I would have to say it’s the most exciting since 3.0 and the implementation of Cut, Copy, Paste! Not even kidding! Some major enhancements, mixed with some minor ones, and the brand new iCloud service really makes the geek in me swoon. Ok, that’s a bit much, but almost! At the time of this writing, Apple’s servers were making up grading a long chore. Enjoy the upgrade, if you can get it! Update: I forgot about the iPad’s best update… Split keyboard! Now you can easily thumb type in landscape mode! Awesome. Oh, and those multitouch gestures I wrote about a few months back in my iPad 2 review are included for everyone now! This entry was posted in Reviews, Tech and tagged Apple, iOS, review, Tech on October 15, 2011 by Dan G..